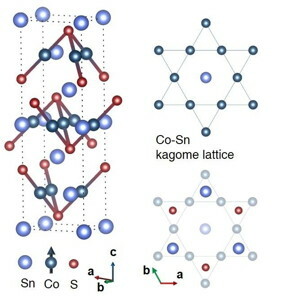 In the kagome layer, the cobalt atoms form triangles around a hexagon with a tin atom in the center. This geometry forces the electrons into some uncomfortable positions - leading this type of material to be called a "frustrated magnet." Funding for this study was provided the Gordon and Betty Moore Foundation, the United States Department of Energy under the Basic Energy Sciences program, the Princeton Center for Theoretical Science and the Princeton Institute for the Science and Technology of Materials Imaging and Analysis Center at Princeton University, Lawrence Berkeley National Laboratory, and the University of California, Berkeley.